I don’t make New Year’s Resolutions, but healthy eating is always a goal of mine. I figure if I eat healthy most of the time and exercise daily then I can eat as many cookies as I want..ha! Just kidding-sort of:) I did go a little cookie crazy during December, so I am trying to refocus. 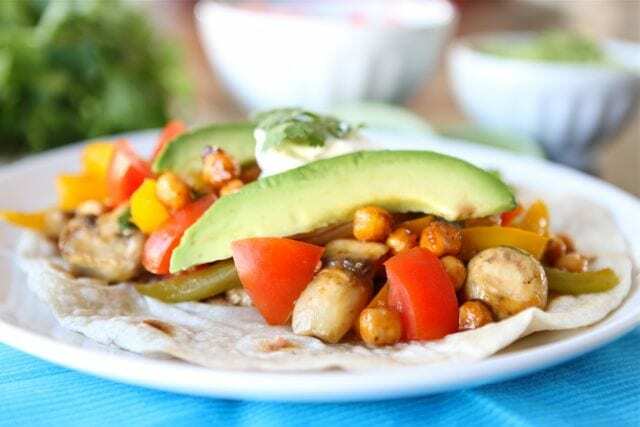 I am excited to share with you one of my new favorite healthy recipes-Roasted Chickpea Fajitas. I love snacking on roasted chickpeas, so I knew I would love them in fajitas. I seasoned the chickpeas with lime juice and fajita spices and roasted them in the oven for 30 minutes. I wanted to crisp them up before adding them to the onion, peppers, and mushrooms. When the chickpeas were done roasting, I stirred them into the sizzling vegetables and added fresh cilantro. When Josh got home from work he asked what was cooking-our house smelled amazing thanks to me:) I told him chickpea fajitas. He thought I said chicken and asked if I was going to start eating meat in 2012. I said no meat for me, we are having CHICKPEA fajitas. He looked intrigued. If you are looking for more healthy recipes, check out our 50 Healthy Recipes to Kick Off 2012 post. Onion, peppers, and mushrooms are sautéed and served with spicy roasted chickpeas to create these healthy and delicious vegetarian fajitas. Garnish with diced tomatoes, avocado slices, and a dollop of Greek yogurt, if desired. 1. To roast the chickpeas: preheat oven to 400 degrees. In a medium bowl, combine chili powder, garlic powder, onion powder, cumin, salt, lime juice and water. Stir in chickpeas. Place seasoned chickpeas on a baking sheet that has been sprayed with cooking spray. Bake for 25-30 minutes, stirring once during cooking, until chickpeas are slightly crispy. 2. While the chickpeas are roasting, in a large skillet, heat oil over medium high heat. Add onions, garlic, peppers, and mushrooms. Cook for 5 minutes. 3. In a small bowl, combine chili powder, cumin, oregano, salt, pepper, and lime juice. Pour mixture over vegetables and cook for another 5 minutes, or until vegetables are tender. Stir in the roasted chickpeas and fresh cilantro. 4. 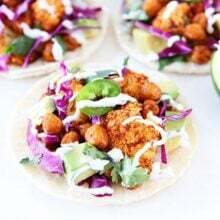 Spoon roasted chickpea and vegetable mixture evenly down the centers of warm tortillas, and garnish with tomatoes, avocado slices, and Greek yogurt. Roll up tortillas, and serve immediately. 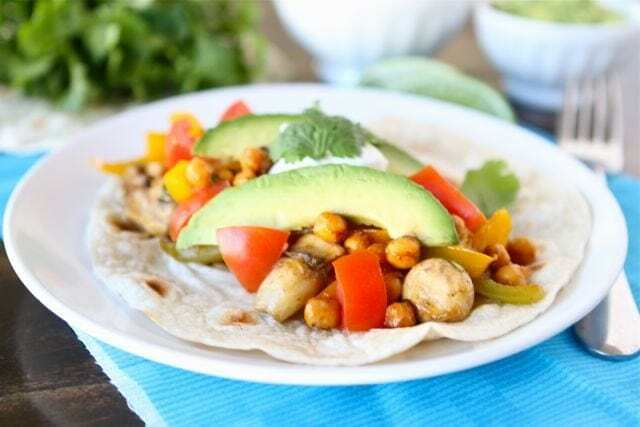 These sound great, I never would have thought of using chick peas in fajitas! I very recently made MamaPeas’ chickpea tacos… divine! 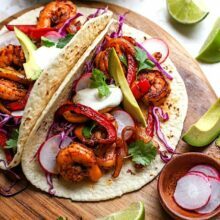 what a yummy way to make fajitas! they’re like the roasted fajita chickpeas i made last week but with all the fixins’…LOVE! Looks terrific! This is just the kind of vegetarian meal I love to serve. i’ve been craving so many avocados lately. love them. this is a very healthy dish–great idea! Can’t wait to try this! I’m also a huge fan of roasted chickpeas and I’m sure they taste great in fajitas. Strange how I never noticed you were a vegetarian before. I’m not vegetarian but I really enjoy eating meat-free most of the time. Yummy! I love roasted chickpeas. And anything that includes avocado is delicious I think! My mouuuuuuuth wants that in IT. Chickpeas are one of my favorite legumes, and I’m always tossing them into my salads so I love this new savory variation with a little olé. Did you use bell peppers or the little sweet peppers? I love this idea, Maria. I’m a meat eater (and so is Peter) but we are intending on making a better effort of eating much less meat this year. This looks like a delicious dinner or lunch idea. I adore chickpeas–they’re my favorite legume. Great recipe! Thank you for sharing it with us. Ok..that sounds absolutely amazing Maria…I love the addition of the roasted chickpeas! Gorgeous! I’m totally with you, Maria! Never making resolutions, but choosing to eat healthy all the time. That’s how to do it! I want, I want!! You were right, I LOVE this recipe & cannot wait to make it! I love chickpeas prepared any way! I love this! Fresh eating is what we do in our home and with half of us vegetarian here, this would be perfect! Thanks! What a great idea for a healthy meal. I never thought to use roasted chickpeas that way! It’s all about balance for me. This is a great way to balance all the cookies that I eat. I love great meatless meals like this. When they have this much flavor, it’s much easier to talk my husband into it too! these sound incredible! i’ll have to try them next time we’re craving Mexican! Nice vegetarian version of a dish that often has far too much meat in it. This sounds like such a great recipe. I am a sucker for chickpeas. It’s my favorite bean! What a great idea, roasting the chickpeas first before mixing it with all the other ingredients. Looks so good, I don’t think anyone would miss the meat. Love how healthy this is. Roasted chickpeas are so good. The spices you used sound like a delicious combination for these fajitas. I had chicken fajitas last night, but this roasted chickpea version has got me craving another round with a twist! This looks great. I always get stuck in a rut and end up cooking the same thing. Often my food tastes good but looks terrible! This is really inspirational as it look lovely and has lots of different textures. Thanks! This is such a fun idea, Maria! I adore roasted chickpeas and love the thought of slipping them into fajitas or sandwich wraps. I eat healthy most of the time, so I don’t make food resolutions, but I do resolve to try new things. I’ve never had roasted chickpeas and now this photo makes me want to. What a great idea of putting it in a tortilla and adding avocado and greek yogurt. Very healthy, delicious and gourmet! Wow, these fajitas look incredible. 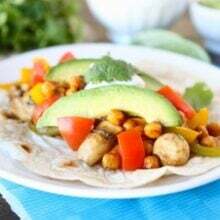 I LOVE the idea of using roasted chickpeas in fajitas! 🙂 YUM! Love seeing those gorgeous avocado slices on your creative fajitas! This reminds me of the first time I made sweet potato and black bean burritos. My husband asked, “what’s the meat?” none. “what’s the cheese?” none. Turned out to be one of his favorite dinners ever! I know he’d love these too, as we are both chickpea fiends! 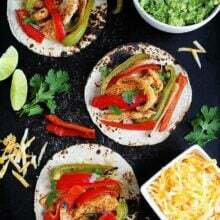 Love the “refocus” these fajitas look great fro lunches or dinners. these fajitas sound delicious! I’m always looking for fun, meat-free versions of my favorite entrees. A definite need to try! Healthy and delicious way to start off the new year. I am doing more beans, vegetables and fruits. Love how colorful these are Maria, so pretty! I usually just make veggie fajitas for myself and chicken for the rest of the family but maybe, just maybe my super meat-eater of a husband will go for these. I haven’t been a fan of the chickpea in anything but hummus until recently but hopefully since they’re crisp in this recipe, we’ll love them! what a delicious way to start the new year! These look totally delicious. 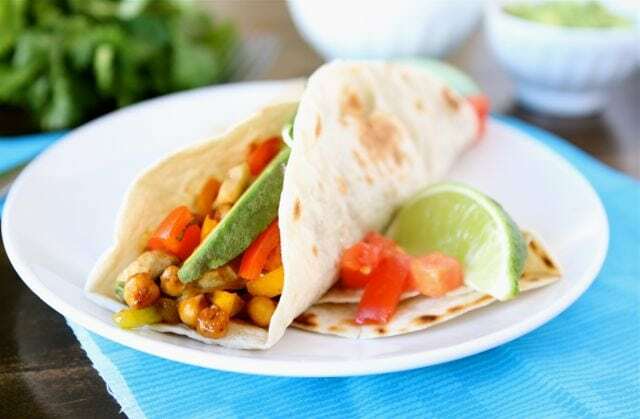 I love vegetarian stye fajitas filled with lots of veggies but, I have never thought of using chickpeas in them before. Great addition! I wouldn’t mind healthy eating with recipes like this one. I am sure it is delicious Maria. Have a wonderful and blessed new year. A great vegetarian way to enjoy fajitas! That my dear, is a great looking fajita! I’ve got to try this right away. I am with you – no resolutions 🙂 Everyone should have a style of living not just in the beginning of the year. Love this recipe! How genuis! I love throwing chickpeas into my Mexican dishes, but I never thought of making them the star of fajitas. This is TOTALLY going on the menu for next week! This looks very good, it makes eating healthy easy! What a creative idea for fajitas! I’ve been wanting to try roasted chickpeas and this sounds like the perfect way to try them! Loving this simple idea. It’s fresh and I’m sure the citrus really makes the flavors pop. Yum. This looks so full of flavor and texture – yum!! I’ve sauted chick peas with spices and ate them as nuts. I love the taste of roasted food, so I’m sure they will be good, plus I won’t have to stand there for 30 min’s frying them! 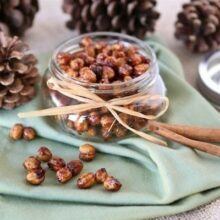 I made your honey roasted chickpeas a few weeks ago, and it set off a storm of chickpea snacking here. I roasted them with Adobo seasoning too, and my family inhaled them! They even eat them out of the can, as I am skinning them. Who knew that one of “mom’s wierd foods” could turn out to be…good?? I am going to make these fajitas this weekend while the going is still good. Can’t beat .67 a can and healthy too! I’m just curious, with your vegetarian cooking, have you ever used any Penzey’s Spices, or their blends? I’m thinking their fajita seasoning would be perfect on this. They have alot of delicious salt free blends that makes eating sometimes bland healthier things better! Penzey’s would be great on the chickpeas! Enjoy! Made these last night and they were so delicious! Glad you liked the fajitas! Thanks Christine! I am glad you are enjoying our recipes! I have been seeing more recipes that substitute chickpeas for meat, and I’m thinking I need to try it out asap! these look amazing! I made these last night for dinner. They were fabulous! Thanks for posting the recipe. My husband has asked that they be a regular on the dinner table. This is such a great idea! I would never have put chickpeas in a Mexican meal but it’s brilliant! Randy LOVES fajitas and I’ve never made them at home. Thanks for the inspiration! I made this today without the onions and garlic. Hubby and I enjoyed it throughly. It so hit the spot. Loved this recipe. Will become a go to dinner for weekdays. A little filling goes a long way and reheats well next day. The yoghurt made up for cheese and the mushrooms sub for meat in my view. I also added some sweet corn to counter the lime. Am trying to go meatless more often and this will definitely be on the menu again! Oh good-glad you enjoyed the fajitas! That sounds AMAZING! Many thanks! Just made these – they were awesome – the chickpea texture was great. Love your website! How did I miss these? These look so good and what a great twist on the classic! This looks so incredible!! I could easily gobble up 3! This pregnancy is full of veggies! All I can handle. People loved it thoroughly. Thank you for this recipe. So glad everyone liked the fajitas! I just made these for dinner and they were DELICIOUS!! Will definitely add this to my recipe collection. Glad you liked the chickpea fajitas! I love what happens to chick peas when they are roasted. I have all these ingredients in my pantry. Can’t wait to try this! I made these last night and they were delicious. The chickpeas are amazing on their own, too. Fajita IS beef and only beef…a cut of meat. Misuse of the word. Fajitas doesn’t mean vegetables tossed together. This is a chick pea stir fry.